David Cameron courted both Christian and Sikh voters, visiting a Sikh temple in Kent the day after speaking at the Festival of Life in London – the UK's largest Christian gathering. Led by Pastor EA Adeboye, the general overseer of the Nigerian Pentecostal Redeemed Christian Church of God, the Festival of Life attracted some 45,000 people to the ExCeL at midnight on Friday. Giving a keynote speech, Cameron joked that catering the event "must be like feeding the 5,000... you must be relieved that it's just spiritual food on the menu tonight." To rousing applause, the prime minister quoted Jesus in Matthew's Gospel: "Together we are all part of one family. As Jesus said with his arms outstretched to his disciples: 'Here are my mother and my brothers, for whoever does the will of my father in heaven is my brother, my sister and my mother'. "And that is what we are, as God's children we are all one big family," he continued. Cameron told those gathered that while as a young boy he thought churches had to look a certain way, with a slate roof, a large spire, pews and a pulpit, "you've proved that church is people, church is a family, and it doesn't matter what the roof is made of, because with your energy, your devotion, your love of Jesus Christ, you raise that roof every time." He described the gathering of Christians as "the Big Society in action". By caring for the ill, mentoring teenagers and providing aid overseas, he said that Christians are working for a better Britain. "Like Jesus turning water into wine, you turn loneliness into companionship, you turn deprivation into comfort [and] you turn lost lives into lives with purpose," he said. "Tonight let us be proud that this is a Christian country, where we stand for the freedom to practice your faith, and where we stand up for Christians and all those who are persecuted anywhere in our world, they are family too." Cameron finished by remembering the schoolgirls kidnapped by Boko Haram in Chibok, Nigeria, last year. "I am a father of two young daughters, Florence and Nancy, and I have an understanding what it's like to lose a child in tragic circumstances," he said. "So my prayer tonight, like yours, is that those girls will be found soon, and there will be peace in Nigeria." 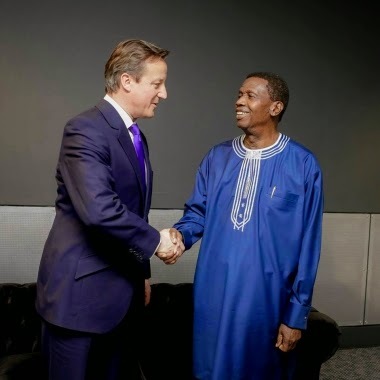 Pastor Adeboye, who has nearly 2.3 million likes on Facebook (over one and a half million more than Cameron) prayed for the prime minister, and many welcomed the politician's appearance. However, others suggested that it was merely a PR stunt to woo the Christian vote in the weeks before the General Election. Writer and photographer, Jendella Benson writes on her blog: "rather than take into consideration the concerns of the electorate he's trying to sway, he [Cameron] turns up and pays lip service to the black church within Britain, hoping that will buy him votes instead. "If there was one message I took away from the incident it was that Black Votes matter, while Black Lives do not," Benson said. "Cameron quotes Christ freely but does not seem to share his same concern for the most vulnerable within our communities." Head of the Conservative Christian Fellowship (CCF) Colin Bloom tweeted that it was one of the most "significant days" in his time with the organisation. "I was so proud to see the prime minister of the United Kingdom talk so passionately about his faith, and the fact that this is a Christian country, in front of nearly 50,000 Christians," Bloom told Christian Today. The suggestion that Cameron is merely trying to court the Christian vote is "complete rubbish", he added. "What he said on Friday is completely consistent with what the prime minister has been saying in every Easter message and every Christmas message... there is nothing new in the prime minster engaging with Christians in a very positive way."